One of the reason for much of the skepticism about global warming is the absolute craziness of fundamentalists in the church of global warming, who blame everything, and I mean everything, on the sins of greedy humankind. One example can be found in last week’s Chicago Sun Times has an article saying that the latest threat coming from global warming is…. The world is being overwhelmed by the cute cuddly playful evil snarling vicious pussycats thanks to Global Warming. Other theories are that cats might mature earlier, or that there is just a lot more garbage out there for feral cats to eat: not only garbage, but increased garbage results in more rats to eat. Or maybe they are finding more places to stay warm, so that fewer kittens die. 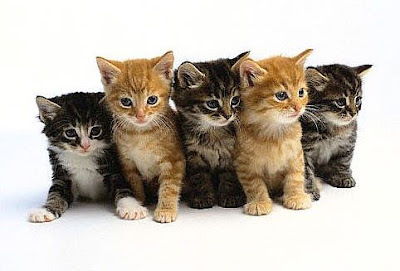 Theoretically, one cat that mates three times a year – cat pregnancies last 63 days and produce four to six kittens – and her offspring could produce 420,000 kittens over seven years, according to the Humane Society of the U.S. I agree. We humans need to stop unwanted cats from being born. Now, if I could only manage to get my tomcat to use a condom…. Nancy Reyes is a retired physician living in the Rural Philippines. Her website is Finest Kind Clinic and Fishmarket. The family has two cats, five dogs, two chickens, and ten koi. 1 user commented in " The Latest Threat from Global Warming: Kittens "
AND THIS LATEST BRILLIANT ARTICLE THAT NEVER TOUCHED A COLLEGE GRADUATE’S HANDS BEFORE IT WAS BARFED ONTO THE INTERNET AS A BRILLIANT REVELATION FROM GOD HIMSELF? ( NEXT YOU FREAKS WILL TRY TO JUSTIFY..LET ME GUESS..CAT MURDERING THUGS-OF-MERCY, LIKE WE HAD IN MIAMI?? ?PROVES ONCE AGAIN, WHEN THE MOUTH FLIES OPEN, IT IS SOMETIMES A L-O-N-G TIME BEFORE THE BRAIN ENGAGES! WHO, BUT A MENTAL-MOFFIT, PICKS UP THIS GARBAGE ON THE INTERNET AND RUNS IT AROUND LIKE IT WAS GOLDEN FACT? BALDERDASH!